Do not confuse the “pulsing” of continuous wave lasers with the super pulsed technology of Multi Radiance lasers. Continuous wave “pulsing” is accomplished literally by "chopping the beam", i.e., mechanically turning the laser on and off. This not only limits the power and so depth of penetration offered by continuous wave lasers, it also encourages the body to adapt to its effects, limiting its treatment ability. 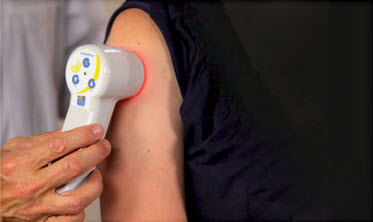 Super Pulsed infrared Laser penetrates to target tissues up to 10—13 cm, and exerts powerful stimulating influences upon blood microcirculation. In general, Laser diodes are either continuous wave or pulsed. The continuous wave diodes emit Laser energy for the entire time they are electrically driven, hence the name. They provide a fixed level of power during emission. Super pulsed diodes emit a series (frequency) of radiation impulses with high amplitude in an extremely short duration (typically 100 to 200 nanoseconds). The mean output of power of a Multi Radiance Medical Super Pulsed Laser will increase as the pulse repetition is increased. Maximum Photonic Density. The power density during these very high pulses yields an extremely high photon flux and saturation, delivering a stronger effect.